Global surface temperatures have essentially remained static since 1998 – a record el Niño year. 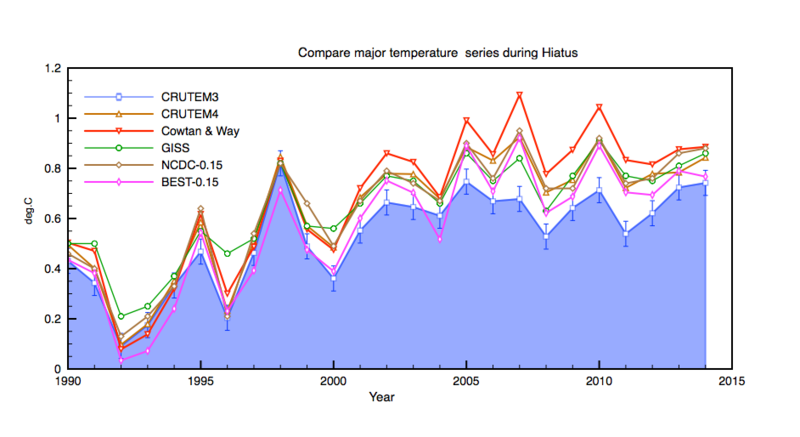 The hiatus in land surface warming is real, unexpected, and puzzling. 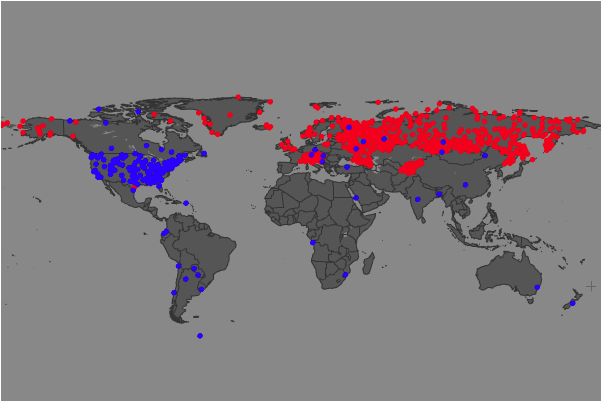 Recent anomaly data are shown below. Comparison of CRUTEM4, CRUTEM3 and GHCN V3C. Error bars are those quoted for CRUTEM3. Until 2010 CRUTEM3 was the IPCC reference land temperature data, and was used for the IPCC 4th assessment report in 2007. It is still updated and shows 1998 as the warmest year with no warming trend since then. GHCN V3C is in agreement with that conclusion. CRUTEM4 was released in 2010, and the main difference to CRUTEM3 was the addition of 628 stations near the Arctic where warming has been strongest. GISS also added a significant number of new Arctic stations. This sampling effect alone has moved the land temperature anomaly to slightly warmer values post 2000. 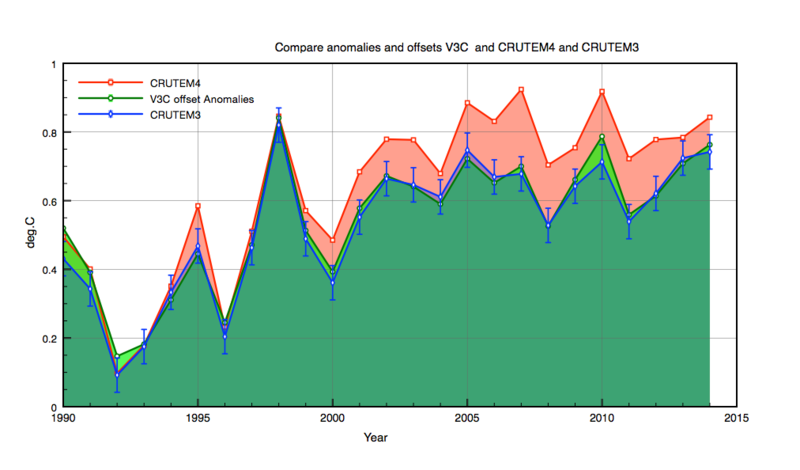 CRUTEM4 now shows 2010 as the hottest year and a small 0.05C/decade warming trend since 1998. In addition there also seems to have been some recent corrections made to station data enhancing this trend since I first made the comparison in 2010 as shown below. Cowtan and Way(2013) also claimed that adding yet more arctic coverage would confirm some continued warming. As I understand it they essentially fill all empty Arctic grid cells with values interpolated from satellite data. However, do they do they also do the same in the Antarctic or the Sahara? However, since then this claim has essentially evaporated as shown below in their updated version V2. 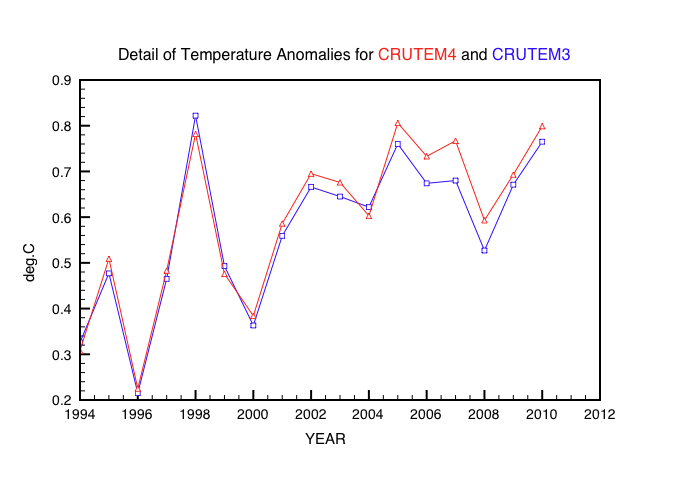 The figure below shows their latest result based on CRUTEM4 and compares to the other main temperature series. The growing evidence of an unexpected hiatus in surface warming, now lasting 16 years clearly caused concern in the climate science community. AR5 skirted round the issue by essentially deciding that such 15 year pauses would happen occasionally due to natural variability. Of course a cynic might argue that natural variability has been tuned in the models exactly for that purpose. Phenomena like ENSO are not fully understood and cannot be predicted. However even with natural variability included only 5% of CMIP5 model ensembles can reproduce such a pause. Furthermore the statistics behind the all important AR5 attribution statement depends on natural variability being essentially random. If not, then a proportion of the observed warming since 1950 would then be due to natural cycles such as AMO/PDO. In this case model predictions of anthropogenic warming would be too high to explain observed anthropogenic warming and the attribution statement would be wrong. 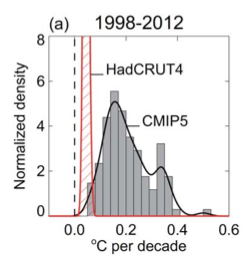 Already most of the CMIP5 model predictions for future warming are on the high side when compared to the exisiting combined land/ocean surface temperatures (HadCrut4). A new proposal to explain the hiatus is that much of the excess heat from TOA radiation imbalance has instead been stored in the deep ocean and will reappear later to warm the surface. However this proposal implies that there are indeed natural ocean driven climate cycles. If so then how much of the rapid warming from 1970-2000 was really due to an upturn in these cycles? The next few years will be interesting. 29/5: updated to use C&W V2 anomalies.